Filipino director Lav Diaz is of the “slow cinema” school of art filmmaking, whose icon is said to be Theo Angeloopulos and progenitors Andrei Tarkovsky, Béla Tarr, and Michelangelo Antonioni. But judging by this ill-judged four-plus-hour meander “based on” Dostoyevsky’s Crime and Punishment, however reportedly more polished than previous efforts and however much festival devotees regard it as a masterpiece, Diaz is far from worthy of comparison with any of the aforementioned artists. His new film is overlong, inept, amateurish, and inexplicable. Moreover rather than emphasising “long takes, and . . .often minimalist, observational, and with little or no narrative,” as slow cinema is described on Wikipedia as being, Norte: The End of History has a story, in two main threads, but one that is simply thin in actual incident, superficial in character development and slow and repetitive in the telling. There are occasional nice images, moments of pastel light, or delicate panoramas; but Diaz’s self-editing is random and clumsy — even though by reports this is a “comparatively streamlined piece of storytelling” (Jonathan Romney, “Screen Daily) — and hence four hours long instead of eight. Rather than a meditative and atmospheric film, this reads like a conventional story, however poorly told, only with a lot of empty filler in between the weepy women, suffering men, and acts of random violence. Romney suggests, rather over-kindly, that this film most resembles “Hou Hsaio-Hsien or perhaps Edward Yang’s A Brighter Summer Day, although in the final stretch, an apocalyptic turn suggests echoes of Bruno Dumont or Carlos Reygadas.” Mike D’Angelo tweet-reviewed it at Cannes “Longest. Dumont movie. Ever. (If Dumont owned up to being a self-loathing intellectual.” Rather than sidestepping action (as Hou and Yang to some extent do, while filling in a rich milieu, Diaz resorts to a final flurry of violent action, together when a cruel Deus ex Machina event. Fabian becomes as brutish as some of Dumont’s more animalistic protagonists, though Dumont’s coherent mood and style are missing. The secondary plot involves a poor family whose male head, Joaqin (the even more undistinguished-looking Archie Alemania), has plunged his wife and kids into worse poverty by being out of work due to a broken leg. This gets both Joaqin and his simpering wife Eliza (Angeli Bayan) into constant trouble with Magda (the unsubtle Mae Paner), a mean, fat moneylender. Tedious scenes follow in which Eliza, and then Joaqin, plead in vain for leniency from Magda. Fabian also is a client of Magda, and an hour into the movie he goes to her house and stabs her to death with a knife, also (off camera) murdering her young daughter because she’s a witness. Joaqin has assaulted Magda over a pawned ring and she has reported this to the police, and so he is collected as the prime suspect and sent to jail for life for the murders. Fabian now fades from the picture while the film meanders back and forth between Joaqin’s prison life and Eliza’s efforts to take care of their two kids by selling vegetables and doing laundry. Joaquin gets into trouble for being too “good”: in a Reygadas-like scene he levitates surrounded by light as if transformed into a saint. Fabian returns briefly to be helped by a well-meaning Christian group; this is when he begins weeping and wailing, which later becomes shouting and grunting. He comes into play more lengthily on a visit to his family’s estate where he is appallingly cold to his well-meaning sister, after which he wrecks further mayhem, and Eliza is removed from the action by an accident. All this could be cut down to ninety minutes or so and in that form might make a clumsy but relatively watchable movie. More is indeed less here. But of course then Diaz would cease to be a slow cinema niche filmmaker and his one raison-d’être would vanish. In any case, avoid. 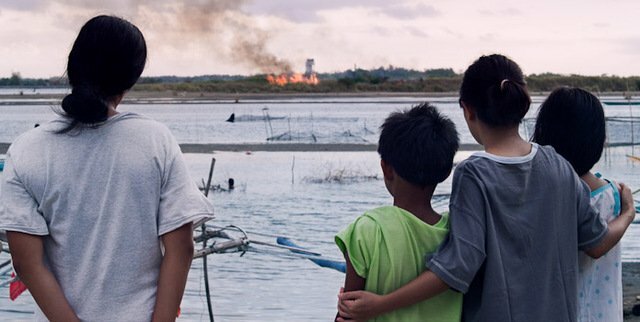 Norte, the End of History/orte, Hangganan ng Kasaysayan debuted in the Un Certain Regard section at Cannes 2013 and continued at Locarno and Toronto and other festivals, including the New York Film Festival at Lincoln Center, where it was screened for this review.